Having a daily mindset of gratefulness is one of those areas we’d all like to improve or achieve. We’d like to be more grateful, but we struggle with it sometimes for various reasons. We’re so busy focusing on what’s not working in our lives, we forget to focus on what is working. We look at what we don’t have instead of what we have. We pray to receive blessings instead of asking that we be a blessing. Then when we try to start becoming more grateful, we can feel like it’s forced or inauthentic. That’s because we’re missing a very key part of gratitude - the starting point of having a grateful mindset - and this is a secret we need to know in order to move forward in being and expressing gratefulness. So what’s the secret of having a gratitude attitude? The secret is….. It’s an inside job. You can’t follow certain steps or do certain things and automatically be transformed into a grateful person. I know that’s ironic considering I’ve promised to share ways to implement gratitude into your life, but just going through the motions and doing things on the outside won’t develop an attitude or mindset of gratitude. True gratitude has to start in our hearts (our desires for gratitude), in our mindsets, and in our individual thoughts toward situations, other people, or even ourselves. Developing that gratitude attitude takes work and intentional effort, but once the work is done, and that grateful mindset begins to develop, you’ll be amazed at how differently your outlook will be, as well as how many benefits there are to being grateful. Not only are there health benefits to adopting a mindset of gratefulness, but there are spiritual benefits as well. For example, Colossians 4:2 says, “Devote yourselves to prayer with an alert mind and a thankful heart.” If we’re keeping an alert mind while we pray, that means we are well aware of any impossibilities we may be praying over, but we have a thankful heart that whatever the outcome, God is in control and the impossibilities are not impossible to Him. In other words, by keeping our hearts filled with gratitude, when we pray, we’re able to pray with more peace and assurance because we aren’t focusing on the situation necessarily but on God’s ability to override the situation. Also, Proverbs 11:25 says, “The generous will prosper; those who refresh others will themselves be refreshed.” When we’re grateful, we will be more inclined to be generous, and when that gratitude and generosity begins to overflow to touch those around us, it not only renews them but it bounces back to us and renews us as well. By being a blessing, we are blessed. So how can we develop a mindset of gratefulness while also expressing our gratitude outwardly and blessing others? 1. Thank someone. Think of someone who has blessed you in some way, and send that person a text, email, or better yet, a handwritten card in the mail. Thank them for their words or actions that blessed you - even if it was years ago! 2. 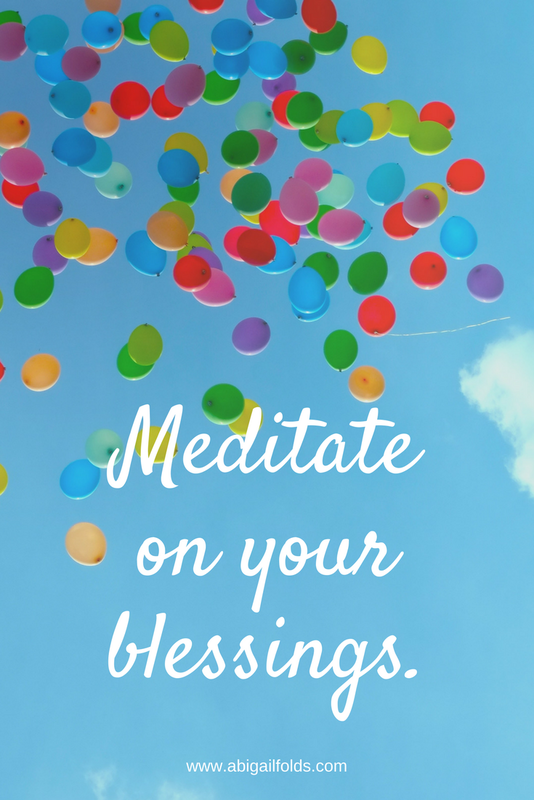 Meditate on your blessings. Instead of rehearsing negative thought patterns or stories over and over in your head, replace those thoughts with remembrances of the good things in your life - even the little things! This will help to shift your focus from whatever you feel you lack toward what you already have. 4. Start keeping a gratitude journal. You can start doing this today and you can do it however you like! If you’re a morning person, set aside a few minutes in your morning to write out 3-5 things you’re grateful for that day. If you’re a night person like me, you can reflect on your day for a few minutes before bed and write out 3-5 things you’re thankful for from that day. Bonus tip #1: Carry it with you during the day so you can jot things down as they happen or come to mind! This is definitely a great way to cultivate an attitude of gratitude. Bonus tip #2: Don’t just write: “house, food, clothes, etc.” but really challenge yourself to look for the hidden blessings in each day. 5. Give. Give food, donate clothing or funds - whatever you’re able to give. Bonus tip: If you really want to strengthen your gratitude muscle, here’s how you can take this one even further: Give where it hurts. We often think of giving money when we hear that phrase, but sometimes, writing a check, swiping a card, or handing over a few bills are the easiest ways to give. Giving things that really cost you - your time, your talents, your energy, your love, etc. - giving those things is a great way to express gratitude. That friend who’s been asking to meet for lunch for the past 2 months? Text her today and set it up. That co-worker who drives you insane? Find a way to do something nice for them - even if it’s just asking them how their weekend was and giving them a few minutes of your attention.